Protect the Empire with the silent and mysterious Shadow Guards. Defeat the toughest enemy with their deadly Lightsaber staffs, and when backup is needed, call in the Shadow Stormtroopers on their flick-missile-armed speeder. This great battle pack includes 4 minifigures with assorted weapons: 2 Shadow Guards and 2 Shadow Stormtroopers. The Shadow Troopers (75079) Lego set is available from the sites below. However, they do not offer delivery to your selected region. The Shadow Troopers (75079) Lego set is no longer directly available from the sites below. However, 3rd party partners of these sites might still have the set available. 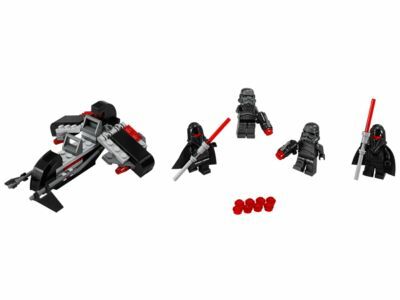 Alternate description Patrol the galaxy with the LEGO® Star Wars Shadow Troopers battle pack with 2 Shadow Guards, 2 Shadow Stormtroopers, speeder and more.